I would like to bind both Super+1 and Super+Home as shortcuts to the "Switch to workspace 1" action in GNOME 3. Is there a way to do this? Or if you prefer CLI you can use dconf or gsettings e.g. gsettings set org.gnome.desktop.wm.keybindings switch-to-workspace-1 "['<Super>Home', '<Super>1']"
Keep in mind the values must be quoted and separated by comma+space. 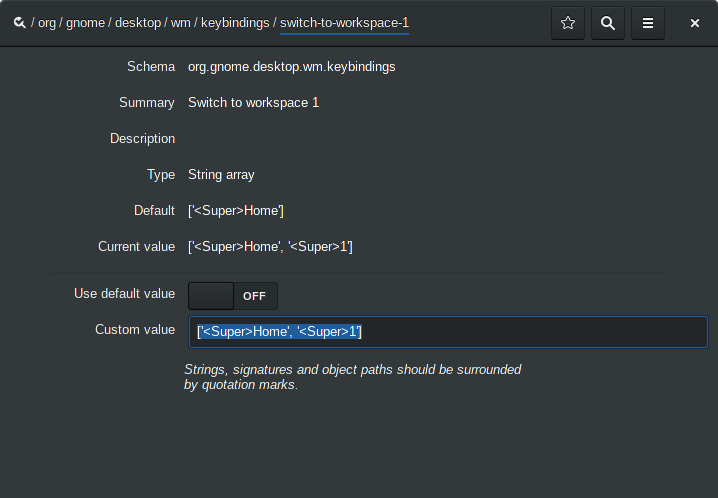 dconf write /org/gnome/desktop/wm/keybindings/switch-to-workspace-1 "['<Super>Home', '<Super>1']"
It will not create workspaces in Gnome 3 which create them dynamically when there are windows on a previous one. Not the answer you're looking for? Browse other questions tagged keyboard-shortcuts gnome3 or ask your own question. How do I allocate a key shortcut to moving GNOME 3 workspaces up/down? Gnome Shell shortcut directly to Workspace List overlay?